wdnicolson.com - An NRL Blog: 2009 Four Nations Final: Lockyer brilliant as Australia run rampant in final quarter, defeat England 46-16. 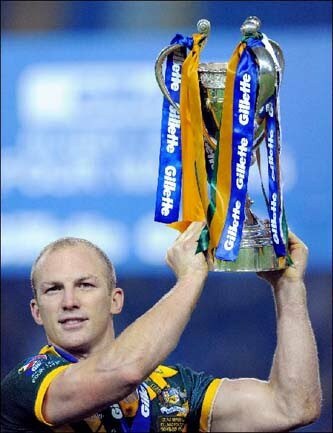 2009 Four Nations Final: Lockyer brilliant as Australia run rampant in final quarter, defeat England 46-16. Never write off a champion. Australia defeat England 46-16 in Four Nations Final at Elland Road, Leeds on November 14, 2009. For the past two seasons since Darren Lockyer had his knee reconstructed, some sections of the media and a fickle fan base have been telling anyone who would listen that the Australian, Queensland and Brisbane captain was past it. They said he was "too fragile, too slow" and "no longer capable of being the dominant player" we saw since his 1995 debut. But how quickly we forget what makes champions, champions. Lockyer produced another superb performance in a big game, leading the Australian Kangaroos to an emphatic 46-16 victory in the 2009 Four Nations Final against England. The game was evenly poised with 25 minutes to go, Australia up 18-16 after Billy Slater scored his first try of the match but then Lockyer instigated a final quarter that produced some breathtaking rugby league. The try he set up for Billy Slater when he was jonny-on-the-spot in support, should tell people he's far from finished. The fact he also set up at least three other tries might also be a good indicator too... and his team won the game. The English had deserved their 16-14 lead when lock forward Sam Burgess scored his second try of the match from a fine Gareth Ellis short ball, but when Lockyer decided the game was there to be won, he combined with Johnathan Thurston, Cameron Smith and Billy Slater to obliterate the English defence in the last 20 minutes. Slater ended with a hat-trick, Thurston picked his spots as well as he has all year, Lockyer had four try assists, Cameron Smith was everywhere around the ruck, Nathan Hindmarsh proved once again he should be in every rep team picked, starting props Petero Civoniceva and Ben Hannant showed how good they were as the Australian bench offered nothing when they were replaced, Jarryd Hayne got more involved as we hoped, Brett Morris put his hand up as the best finishing winger in the country, Paul Gallen and Luke Lewis did their job well and Greg Inglis was making his case for the title of the game's best player with another HUGE play when his team needed it. As good as England played in the opening 60 minutes (Burgess, Ellis and Peacock were outstanding), Australia were better. And in that flurry of try after try to end the game - they showed everyone what is possible when the best players in the world turn it on. Sam Burgess will be a success in the NRL - injury free we hope. And what this game told us was the more English players who back themselves to come over to Australia to test themselves the better for the international game. Gareth Ellis will be even better in 2010 and looked excellent during the Four Nations, while we can only lament the lack of Jamie Peacock on our shores in the past decade. And it was great to see Adrian Morley again - what a great player he is. Lockyer now enters a new two-year contract with the Brisbane Broncos. He said in the press conference that his gut tells him he won't be back in England in Australian colours again but he refused to say he was done with representative Rugby League. One thing this performance showed us all is that Lockyer - at his best - is still a champion player. Everyone wanted to tell Andrew Johns he was almost done before the 2006 NRL Season and he produced arguably his finest regular season in the twilight of his career - only a fool would say Lockyer isn't capable of doing the same with Brisbane in 2010. @ Elland Road, Leeds. 14th November 2009. Tries: Billy Slater 3 (54th, 69th, 77th), Brett Morris 2 (14th & 59th), Greg Inglis (25th), Cameron Smith (67th), Jarryd Hayne (73rd). Goals: Johnathan Thurston 7/9 Attempts. Tries: Sam Burgess 2 (10th & 50th), Peter Fox (19th). Goals: Kevin Sinfield 2/3 Attempts. Poor Quality but only video on YouTube that delivers. Which Morris twin is this? Give you a clue... he scored at least one try in the Final.